There are no letters from Meade for a while, but on November 13 Theodore Lyman weighs in with his observations on the Army of the Potomac after the victory at Rappahannock Station. He also runs into an old friend, whose experiences demonstrate how tough life could be for a Union man in Virginia. 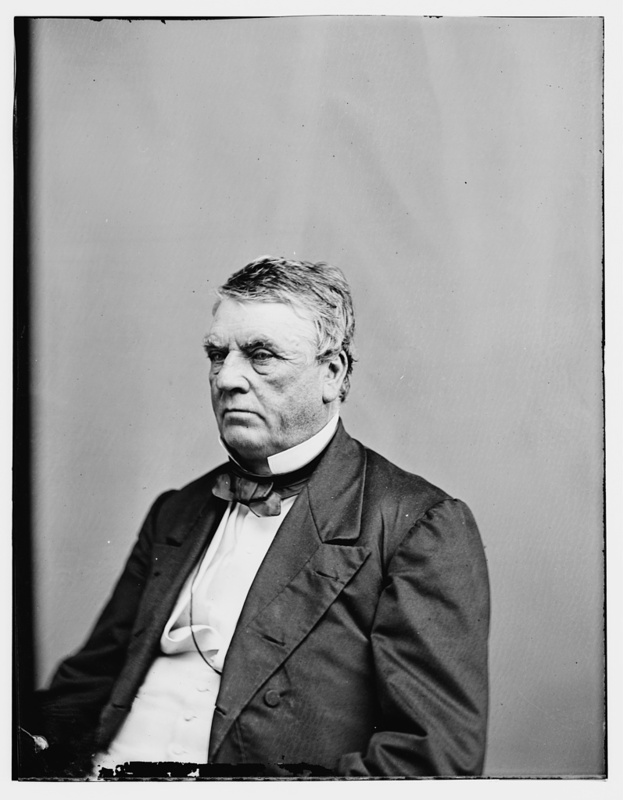 John Minor Botts (Library of Congress). Here we continue to dwell in our pine wood, in grave content, consuming herds of cattle and car-loads of bread with much regularity. Yesterday, who should turn up but John Minor Botts, the tough and unterrified. [We met Botts here.] The Rebs treated him pretty badly this time, because he invited General Meade to dine; burnt his fences, shot his cattle and took all his corn and provisions, and finally arrested him and took him as far as Culpeper, but there concluded he was a hot potato and set him free. He was inclined to pitch into us, for not following sharper after the Rebs on Sunday morning, that is, the day after we forced the river. He said the first of their waggons did not pass his house till two at night and the rear of the column not till ten next morning; that the roads were choked with footmen, guns, cavalry and ambulances, all hurrying for the Rapid Ann. In good sooth I suppose that a shade more mercury in the feet of some of our officers might do no harm; but, on the other hand, it is to be noticed that we had excellent reason to expect, and believe, that they would not run, but only retire to the ridges near Brandy Station and there offer battle. In this case, the premature hurrying forward of a portion of the troops might well have ruined the day. All of which reminds me of Colonel Locke’s remark: “If we were omniscient, omnipresent, and omnipotent, we might, with care, get a very pretty fight out of the Rebs!” As it was, what we did do was done as scientifically as any army in the world could have done it, and with a minimum loss of life. I do assure you that Rappahannock station was a position where thousands of men might have been destroyed, with no gain whatsoever, if managed by unskilful officers; and even Kelly’s Ford was not without serious difficulties. I don’t recollect whether I told you that the enemy had made preparations for nice winter quarters, and were hutting themselves and had made some capital corduroy roads against the mud season. In one hut was found a half-finished letter, from an officer to his wife, in which he said that the Yanks had gone into winter quarters, and that they were doing the same, so that he expected a nice quiet time for some months. Poor man! The Yanks made themselves very comfortable that same evening in his new cabin. Our future movements, or standing still, lie between the General and the weather. Meantime we have to pause a little, for there isn’t a thing to eat in this broad land, and every pound of meat and quart of oats for tens of thousands of men and animals must come by a broken railroad from Alexandria. . . . The Palatinate, during the wars of Louis XIV, could scarcely have looked so desolate as this country. The houses that have not been actually burnt usually look almost worse than those that have: so dreary are they with their windows without sashes, and their open doors, and their walls half stripped of boards. Hundreds of acres of stumps show where once good timber stood, and the arable fields are covered with weeds and blackberry vines, or with the desolate marks of old camps — the burnt spots, where the fires were, the trenches cut round the tents, and the poles, and old bones and tin pots that invariably lie about. . . .
As you walk about the country, you often see fragments of shell scattered around; for all this country has been fought over, back and forth, either in skirmishes or battles; and here and there, you come on a little ridge of earth, marked by a bit of board, on which is scrawled the name of the soldier, who lies where he fell, in this desert region. Our people are very different from the Europeans in their care for the dead, and mark each grave with its name; even in the heat of battle. Theodore Lyman’s letter is from Meade’s Headquarters, 1863-1865: Letters of Colonel Theodore Lyman from the Wilderness to Appomattox, pp. 46-8. Edited by George R. Agassiz. Boston, Massachusetts Historical Society, 1922. Available via Google Books. On November 9 Meade writes to his wife with his comments on the Battle of Rappahannock Station. When I last wrote to you I thought we were on the eve of a great battle, and I was also under the impression that the work I had before me was likely to prove a very severe task. The enemy occupied very strong positions on the Rappahannock, which at one place I knew were strongly entrenched, and I believed they were so at other points. Thanks, however, to their being entirely deceived as to my capacity to move, and to the gallantry of my men, we were enabled to carry then- strong works and to force the passage of the river (considered one of the most critical operations in war), with a comparatively small loss, and with great eclat, as we captured four guns, eight battle flags and nearly two thousand prisoners. The operation being successful, the army is in fine spirits, and of course I am more popular than ever, having been greeted yesterday as I rode through the ranks with great cheering; and my having forced the passage of the Rappahannock and compelled Lee to retire to the Rapidan, will I trust convince the intelligent public that my retreat to Centreville was not to avoid battle, and that Lee, who was not outflanked, or had his communications threatened, but was attacked in front, and yet withdrew, is really the one who has avoided battle. I certainly expected he would fight, and can only now account for his not doing so on the ground that he was deceived as to my strength and construed my sudden and bold advance into an evidence that I had been strongly reinforced and greatly outnumbered him. I must say I was greatly disappointed when I found Lee refused my offer of battle, because I was most desirous of effecting something decisive, and I know his refusal was only a postponement of a question that had to be met and decided. I have received a telegram from the President, expressing his satisfaction with my operations. Meade’s correspondence taken from The Life and Letters of George Gordon Meade, Major-General United States Army, Vol. 2, (New York: Charles Scribner’s Sons, 1913), pp. 155-6. Available via Google Books. 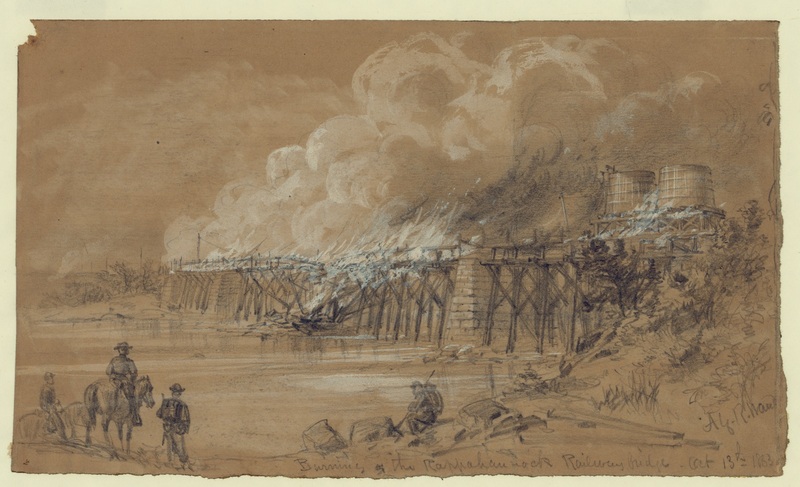 Artist Alfred Waud called this drawing “Capture of the fortifications on the Rappahannock at the Railway Bridge–by the right wing commanded by Genl. Sedgwick” (Library of Congress). Click to enlarge. In his letter of November 7, 1863, Theodore Lyman describes the Army of the Potomac’s small but unexpected triumph at a spot called Rappahannock Station. Today the small village alongside the river is called Remington, but it’s been a place of many names. First a riverside gristmill gave it the name of Millview. In 1850 it became Bowenville, after a prominent resident. Three years later the arrival of the Orange and Alexandria Railroad rechristened it Rappahannock Station. In 1890 the post office requested a change because of confusion with a town called Tappahannock. A Captain Remington was supposedly a popular conductor on the railroad, so the residents decided to name it after him. Back in 1863 Meade’s plan called for William French and the III Corps to cross the Rappahannock River downstream at ever-busy Kelly’s Ford. At the same time John Sedgwick, in overall command of the V and VI Corps (with Brig. Gen. Horatio Wright taking immediate command of Sedgwick’s corps), would attack the rebel breastworks at Rappahannock Station. Most of the Confederate army lay in wait on the other side of the river, but the rebels had constructed a strong advance position on the north bank, using entrenchments that Union soldiers had constructed earlier in the war. For once, not only did everything go according to plan, but everything went better than anyone dared hope. On the morning of November 7 French successfully crossed the river at Kelly’s Ford. At Rappahannock Station, the VI Corps approached the Confederate works to the right of the railroad, with the V Corps to the left. Then the men of the VI Corps began charging the rebel lines at double-quick and rushed over the works like a tsunami. The first man over the Confederate breastworks was supposedly a sergeant from the 6th Maine, who looked around, realized he was surrounded by rebel troops, and shouted that he surrendered. Then he saw other men from his regiment jumping over the works behind him. “I take it back!” he cried and snatched up an enemy flag. The fighting was fierce and concentrated until elements of the V Corps attacked from the flank and rear, shattering the rebel defenses. Night fell and the battle was over. It was a sudden and unexpected victory, with the Federals having killed, wounded, or captured more than sixteen hundred Confederates.
. . . This morning, forward march! horse, foot, and artillery, all streaming towards Dixie; weather fresh and fine, nothing to mar but a high wind, and, in some places, clouds of dust. Everyone was hearty; there was General [Alexander] Hays, in bed with rheumatism, but he hopped up, and got on his horse, remarking that, “if there were any Rebs to catch, he was all well.” Our last Headquarters were on the Warrenton branch railroad, half a mile north of it and three miles from Warrenton Junction. 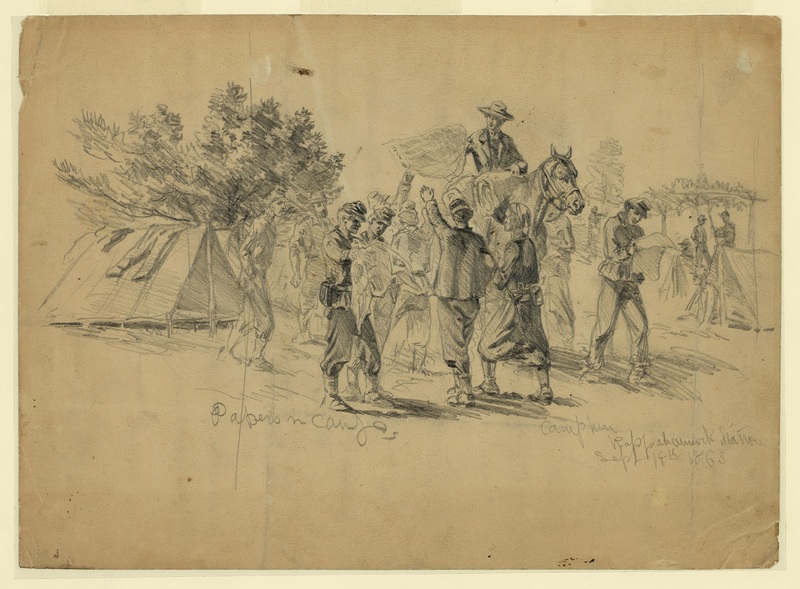 This morning, about 8.30, when all the troops were reported under way, the General started and rode, first to Warrenton Junction, and then down the railroad, towards the Rappahannock. At a rising ground, where a smoke-stained chimney marked the ruins of “Bealton,” we halted. Hence we could see a considerable distance, in both directions, and here was canny [Gouverneur] Warren, waiting while his corps filed past, his little black eyes open to everything, from the grand movements of the entire army down to the inscription on my swordguard, which he immediately detected, and read with much gravity. The last I saw of him he climbed on his big white horse and remarked with a wink: “As soon as I get there, I shall bring on a general action, right off.” It was here that I had quite a surprise. Looking through my glass at General [Alexander] Webb’s division, I detected two civilians, in English-looking clothes, riding with the Staff. As they approached, it seemed to me that the face of one was familiar; and as they rode up, behold, to be sure, the Hon. Mr. Yorke, who was our fellow passenger and played on the fiddle and admired the baby! He was in the Royal Artillery, you know, and had come down to see what he could. And there he was, much covered with dust, but cheerful and pleasant to the last. 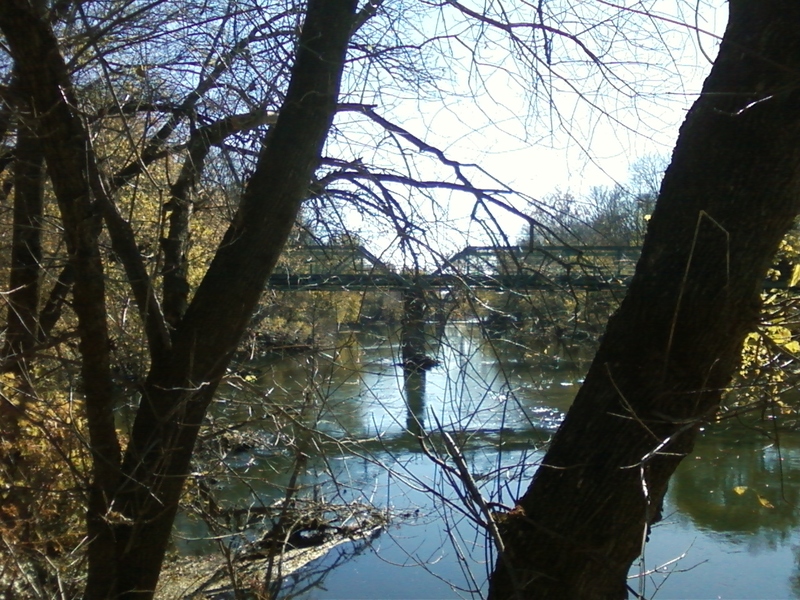 A view of the modern railroad bridge across the Rappahannock at Remington. In 1863 this was Rappahannock Station and the bridge had been burned (Tom Huntington photo). It was a fine sight to see the great, black columns of infantry, moving steadily along, their muskets glittering in the sun (for the day was quite perfect as to clearness), and then the batteries on the flank, and, in the rear, the train of ambulances preceded by their yellow flag. As the masses drew near, they resolved themselves, first into brigades, then into regiments, and then you could distinguish the individual soldiers, covered with dust and bending under their heavy packs, but trudging manfully along, with the patient air of old sojers. And so we kept on to these Headquarters; but we were only half way (at 1.30), when bang! bang! we heard the cannon, in the direction of Rappahannock station. It was General Sedgwick attacking the enemy’s works on this side of the river. We had not got a mile, when whang! whang! in another direction, announced General French preparing to force Kelly’s Ford. For, at these two points, among others, we proposed to cross and wake up our Uncle Lee. The gallant General did not wait to play long shots or throw pontoon bridges. An entire division took to the water, forded the river, in face of the enemy, and, charging up the opposite bank, took 300 prisoners. The Rebs threw forward a supporting division, but the crafty French had established guns on this side of the river, that suddenly opened on them and drove them back. All the afternoon Sedgwick has been engaged against the rifle-pits and a redoubt, that the enemy held on this side of the river. Quite late, we got a despatch that he had driven them from their rifle-pits, and we thought he had done pretty well for an afternoon. But, just at dusk, the distant roll of musketry indicated that he was assaulting; and a telegraph has just come, that he has taken the redoubt with four cannon, and some prisoners; I do not yet know how many. So we go to sleep, encouraged and hopeful. Our losses I do not know, but they can hardly be much, as but a portion has been engaged. . . .
Theodore Lyman’s letter is from Meade’s Headquarters, 1863-1865: Letters of Colonel Theodore Lyman from the Wilderness to Appomattox, pp. 42-4. Edited by George R. Agassiz. Boston, Massachusetts Historical Society, 1922. Available via Google Books.